You may have noticed that a significant number of major websites were unavailable for a few hours this morning, ie: Twitter, Etsy, Spotify, and Netflix to name a few. After initial investigations, we found that most of these sites shared the same managed DNS provider. Around 7am this morning, Dyn announced that they were struggling to keep their network online after they were hit with a massive DDoS attack (you can learn more about DDoS attacks here). 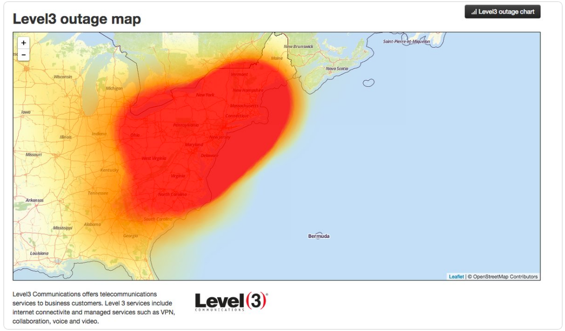 The attack resulted in intermittent outages for many of their clients’ websites. Some clients were less directly affected, with only portions of their sites unable to resolve, or suffering from latency. The attack seemed to be limited to the US East Coast, where the company’s headquarters are located. During the course of the outage, our own clients began to express their concerns, wondering if our network could be susceptible to an attack like the one this morning. First off, attacks like this are not the norm. It seems that DDoS attacks aimed at managed hosting providers are happening more frequently, and with increasing severity. You may remember earlier this year, another provider was knocked offline by one of the most complex attacks ever recorded. This morning, I received some questions through our support system asking whether we believed our network could withstand a similar attack. DNS Made Easy fends off many attacks every single month / week / day and they are usually mitigated without any performance or uptime problems at all. This is because we invest almost everything we can right back into our infrastructure. And we believe this is the reason why we outperform our competitors in speed month after month. We invest the majority of our resources into advancing our technology and increasing redundancy and performance. Many other organizations invest more heavily in sales and marketing. When a technical company has more sales reps. Many other providers focus their resources more heavily in sales and marketing, rather than improving their infrastructure. When a high-tech company has a larger sales department than technical… you know the company fundamentals are misaligned. Because we are steadfast in the same priorities we have held since we launched in 2001, we believe that our network is fundamentally stronger and able to withstand such attacks. Of course, without knowing the full extent of the attack, there is no way to be certain whether or not our network could handle this either. But we will continue to be confident, and reassure our clients that we offer the best solution in the industry. We must also stress the importance of doing your due diligence by researching DNS providers thoroughly, before moving your traffic over. We recommend using a Secondary DNS provider as a backup, in case your primary provider fails.